they don't have these in Michigan? hah jk thanks for the comment! F50 for me. This picture may be as close as I'll ever get to one. You're probably lambohead on Flickr, right? I technically have a Flickr too, but I never use it. @OCCA Gordon is Effspot, right? I didn't know you knew him. Do you have a carspotting Facebook page? @OCCA that is awesome I was the guy that was with you when we saw the enzo and F50 at night. The holy grails!!! Great combo! Steven... I just can say about this combo: Stunning!!! AWESOME WORK! nice! u take a pic of the same enzo? Yah, me and my buddy gordon ( Black shirt, Black Pants ) were leaping in that area! Haha that's me in the white shirt, the person sitting down! The F40 was at a rally, so I didn't get any legit spots of it. It was amazing though. Me too but I didn't get to see the F40 :( I was there friday and saturday. Awesome to see them together. I saw them both on Ocean Avenue, but they were parked a few blocks apart. 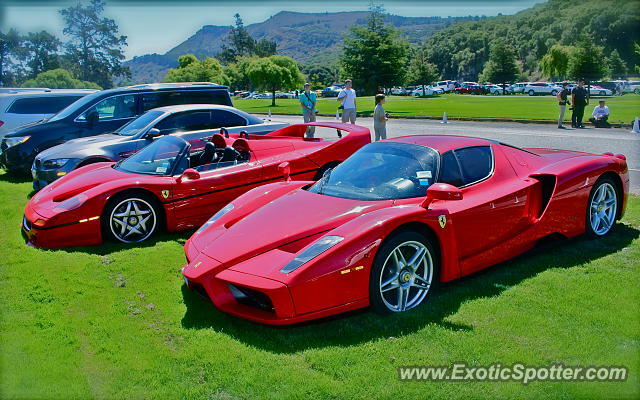 Car week was great for me because I saw my first Enzos, F50, and F40. Thanks, me too its a fantastic car!